Growing up on his family farm in Knokke-Heist, a charming rural retreat in Belgium’s north-east coastline, Axel De Bisscop fell in love with the abandoned 18th-century fort in the adjoining farm. So when the property came on the market in 2012, he was quick to snap it up with ambitious plans to convert it into a private residence, and a five-room bread and breakfast. 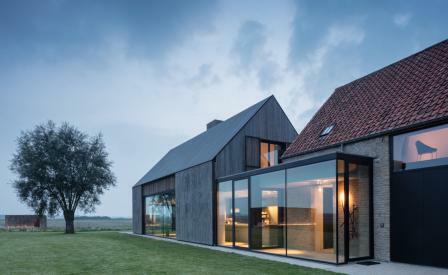 Bruges-based studio Architectuurburo Govaert & Vanhoutte were called in to renovate the two principal brick buildings – a farmhouse and a barn, which had once been the fort’s watch house and jail – in a harmonious sequence of slatted timber screens, glass walkway and brick. With Belgium’s cold winters in mind, an underground tunnel was dug to connect to the lap-pool and infra-red sauna whilst a clutch of original stone bunkers built around the First World War encircling the grounds now house chickens, sheep and bees which supply the dining table with honey and eggs. Interior designer Kristof Goossens, meanwhile, counters the buildings’ lofty interiors of concrete, timber and stone with deeply set grey sofas, thick-piled rugs and wire chairs. Taking centre-stage is a sleek kitchen sheathed in black powder-coated steel specified by Vipp, a favourite marque of the owners who also worked closely with the kitchen specialists on the lamps and a sophisticated rack system. When the bucolic views of fields and sheep no longer enchant, then Damme and Bruges are a 15 minute drive away.